Residents in Horncastle will next month have the chance to question County Council highways officials about the state of local roads. 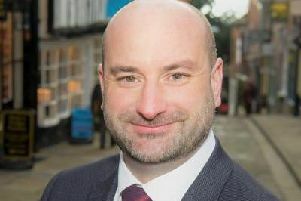 Councillor Richard Davies, Executive Councillor for Highways and Transport at County Hall, will attend the monthly meeting of the town council on July 10. There will be a public forum before the meeting, and it is planned to allow people to question Coun Davies and a local highways officer. Town clerk Amanda Bushell is asking people to submit questions in writing beforehand. She says that will allow Coun Davies and the officer to hopefully have answers to specific issues. People who are unable to attend the meeting - which will be held at Stanhope Hall (7pm) - can also submit questions in writing. Town councillors have been critical of the County Council’s highways policy in recent months and, not least, the controversy over the failure to provide an updated system for reporting potholes. Councillors are also likely to press Coun Davies for updates on the ambitious Coastal Highway programme - an upgrade of the A158 from Lincoln to the Coast. Although at an early stage, the project could include a long-awaited by-pass for Horncastle after more complaints this summer about lengthy delays, particularly on Boston Road. •Highways officials are due to visit Horncastle next month to put final plans in place for major improvements to West Street. Work on West Street, the junction with the A158 and Langton Hill could take until December to complete.